Water resource management in California is often extensive and complex and deserves a comprehensive data and modeling approach. The Hobbes Project is a new effort to provide a venue for modelers in California and elsewhere to create an open, organized and documented quantitative representation of the state's intertied water resources system. Geocoded elements in this database can be interactively converted into tiered networks able to be solved by multiple modeling platforms depending on user preferences, with the appropriate translators. Many Hobbes tools will be web-based with exporting capabilities to the most common analytical and modeling software. 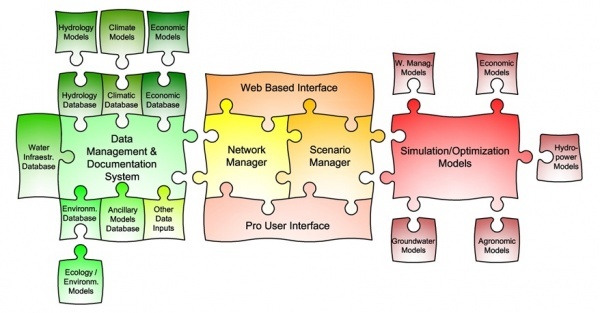 As shown in Figure 1, users of the Hobbes Project will be able to visualize different documented elements in a common web-based mapping application, run specific modeling networks using either the Hobbes basic database, network managers scenario manager software pieces and visualize model outputs in tabular form, chart templates, maps or simply exporting the modeling network, its input data and/or its modeling output to be used in other platforms.